The two leaders watch the signing of the deal. Two of the largest real estate developers in the UAE - Dubai-based Emaar Properties and Abu Dhabi-based Aldar Properties -- have entered into a strategic joint venture to develop projects worth Dh30 billion ($8.17 billion) locally and internationally. The JV has an initial focus on two projects, one in Dubai and another in Abu Dhabi, and brings together the capabilities of the two developers to deliver exceptional destinations, designed with a focus on people and future lifestyle trends. It also acts as a catalyst for other potential co-investment opportunities between the developers in Abu Dhabi and Dubai, said a statement. 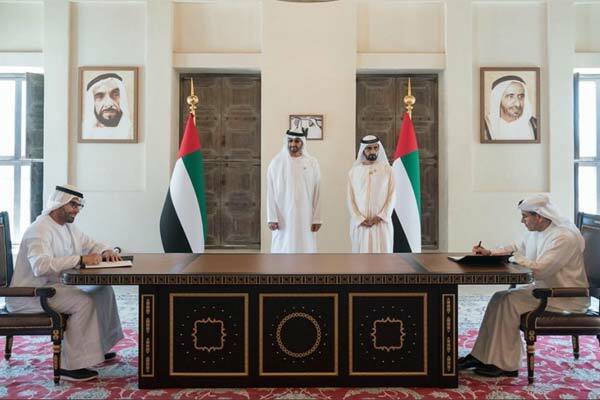 UAE Vice President and Prime Minister and Ruler of Dubai His Highness Sheikh Mohammed bin Rashid Al Maktoum and Crown Prince of Abu Dhabi and Deputy Supreme Commander of the UAE Armed Forces His Highness Sheikh Mohamed bin Zayed Al Nahyan attended the signing of the joint venture agreement. Sheikh Mohammed bin Rashid highlighted the importance of cooperation between the UAE’s two leading developers. “We are happy to witness the signing of this partnership, which will contribute to our development journey and help enhance the UAE’s position as a tourism destination of choice. "We have great ambitions and we are confident our national firms have the capabilities to achieve them. We want our companies to be at the forefront of our development and collaborate with each other to explore creative ideas for strengthening the UAE’s leadership, and enhancing the happiness and quality of life of our people,” he said. Sheikh Mohamed bin Zayed applauded the partnership between the two firms, and wished them success in promoting growth and excellence. This partnership aims to create new opportunities for investment growth, and identify innovative projects that can enhance the UAE’s leadership and competitiveness, he said. In a first for the country’s leading developers, the JV signifies the strong bond between Abu Dhabi and Dubai as they seek to cement the UAE’s reputation for creating the world’s most innovative developments, said the statement. The alliance will develop the next era of iconic destinations that will shape the UAE’s ever-evolving skyline, it said. The historic JV was signed by Mohamed Khalifa Al Mubarak, chairman of Aldar Properties, and Mohamed Alabbar, chairman of Emaar Properties. The JV will initially focus on two projects – one in Dubai and one in Abu Dhabi, demonstrating the co-investment between the two developers. The master-planned destination in Abu Dhabi will be situated in the heart of the emirate’s cultural district on Al Saadiyat Island, named Saadiyat Grove. The development is set to become Abu Dhabi’s most coveted address, serving as a hub for visitors to three world-class museums as well as residents of the island, which is synonymous with natural beauty, cultural experiences, architectural splendour and vast business potential. The development will provide a pivotal link between the Louvre Abu Dhabi, which opened to international acclaim in November 2017, as well as the planned Zayed National Museum, the UAE’s first national museum, and the Guggenheim Abu Dhabi. Set to open in 2021, the mixed-use development will feature close to 2,000 residential units, two world-class hotels, 400 serviced apartments and 130,000 sq m of experiential lifestyle and retail space. The Dubai project - Emaar Beachfront - is a unique new waterfront destination. The private island will feature a wide range of leisure and lifestyle attractions including F&B outlets, beachside play areas, retail pop-ups set along a promenade, and more. Residents of Emaar Beachfront, comprising approximately 7,000 residential units, have access to a 1.5-km private sandy beach.